At various times in the past I have made all of the clothing in this picture except my Brother’s clothing (he is wearing the red hat.) This picture was taken at our Investiture in 2003. I even made the tents. I have been in the SCA for too many years to count. When I started in the SCA, as a college Freshman, I was interested in Anglo-Saxon Clothing. I had done a project for a costume design class. I made T-Tunics. I embroidered them. I wore them and I was happy. However I got tired of people offering to teach me to sew or not understanding the amount of work that went into the embroidery on a new dress. I tried a few different time periods for a number of years. I got lots of compliments on my later period garb, but it is not me. Over ten years ago I decided that I just wanted an early period persona and I have made very few things for myself that are post 1000 AD. (Usually those were group projects for our Baronage.) I have made a few garments that are Norse, but most folks cannot tell them apart. 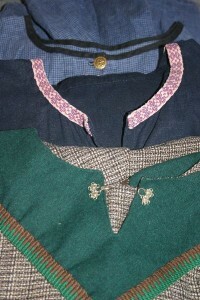 When I want to sew something from a later time period I just make my husband, kids or friends a new outfit. I now have a full wardrobe to go camping at Pennsic for two weeks and not need to do laundry. I know that the amount of clothing I take camping is not period, but this is my hobby and I enjoy sewing. I am also working on picking more period colored fabrics, but I really love loud colored clothing. (Just look at me at a business meeting.) I am always on the hunt for stripes and plaids in linen, because I want to wear them together. 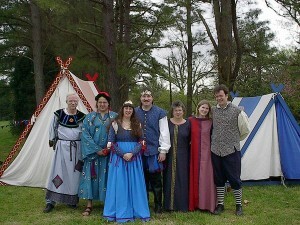 Several years ago I tried to go to Pennsic without making myself a new dress. It was no fun to go on our yearly vacation without anything new. So I get at least one new dress a year. My oldest son gets a new wardrobe every other year, life is not fair! I do not remember where I came across the tip on how do you upgrade your kit without starting over, one piece at a time. Just learn to do one thing better than you did the last time you made a garment. I have been doing that. I changed my pattern. I have changed my neckline and hem finishes several times. I put fewer embroidered pieces on my garb and when I do they do not come from Dover Books. I use different seam treatments and the insides of my garb are as finished as the outside. Long ago I switched to linen and love the look/feel. There are very few extant textiles from before the year 1000. What is available is usually from multiple cultures and widely spaced over the time period. For that reason I do not have a lot of my research written as SCA Documentation. I have read just about every book I can get my hands on that is Anglo-Saxon textile related and purchased it if it was any good. For that matter I have a lot of Viking books as well. I am including a bunch of pictures, so you can see my work.